What led you to Toledo? Our family was heading to the Toledo Zoo Christmas light display, and I had been to Maumee Bay Brewing Co. before, and it was just time for a return visit. How's the brewery? This is a great place. Park, head upstairs, grab some popcorn, and start your visit off right. All of their venues are run out of the very historic Oliver House. This is an awesome building. Let's start with the beer. They've got something for everyone, including the historic Buckeye Beer. How was the burger? Pretty good. They have a massive menu, and even if you don't want a burger, you'll leave happy. I ordered the Cowboy Burger, and it featured bacon and onion straws with some BBQ sauce and cheddar cheese. They have a lot of good looking burgers, such as the Cow vs Pig Burger. Would you go here again? Yes, for sure. It's a neat place. What else? Go down to Toledo and go to Maumee Brewing Co. and also hit a Mud Hens baseball game. What's all the Juicy excitement about? 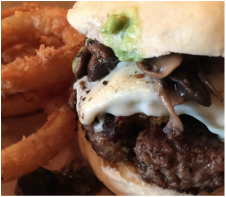 The Juicy Lucy, spelled with an “i” in this case, is a cheese stuffed burger that has gained popularity over the past 90 years and the 5-8 has made this Twin Cities delight spread throughout the area with multiple locations. How's the 5-8 Juicy Lucy taste? 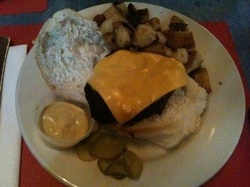 The burger was a bit dry for me and the cheeses didn't have a good relationship with the meat. I expected the cheeses to ooze into the meat. It did not. I expected more of a team effort between the cheese and meat. Okay, so you aren't feeling the burger, how about this sides? The sides are plentiful. Their “snacks and starters” consist of a variety of sides ranging from crispy onion rings and fries to pickle chips and cheese curds. The onion straws looked delicious as everyone in the place continued to order them all around us. In our experience the star of the sides show were the sweet potato fries with marshmallow sauce. Who do you think has the better cheese stuffed burger in Minneapolis? That's easy, it's Matt's Bar in my opinion. Would you go here again? No. Anything else the people should know? Nope. What is a Jucy Lucy? 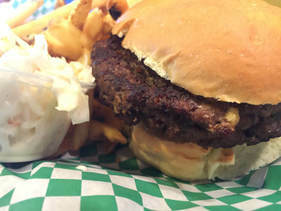 A Jucy Lucy is a cheese stuffed burger. Imagine two fresh meat patties surrounding a golden collection of American cheese. Matt’s Bar does it just right and the end result is an oozing masterpiece. How's the Jucy Lucy taste? It's so darn good. It's a burger masterpiece and it's served on wax paper. Make sure to order with onions! Where is this place in relationship to downtown Minneapolis? It's a bit south of downtown, tucked into a neighborhood. It's worth taking the time to visit, even though you might not want to leave the downtown area. You won't be disappointed. Would you go back here? Yes! 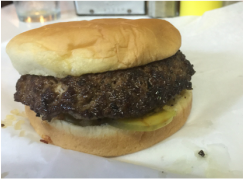 Is it true that you almost gave up searching for exceptional burgers after you ate this Jucy Lucy? Yes, it's true. This place has everything a burger lover looks for. The burger tasted so good and I can't stop thinking about it. I often think that I could be waisting my time looking for a better burger, but we all know that hamburgers are just too good to give up. What do you want everyone to know about Matt's Barr? Check out the Full Review on File. What made you end up in Knoxville? I was on the way down to Florida and we needed to stop for a burger. How did you find this place? I asked a few people in passing where they would go for a burger and after hearing the same place multiple times, we ended up at the Stock & Barrel. Did you really order avocado on your burger? Yes, I did. I was on vacation and feeling adventurous. Normally I don't wander too far off of my standard cheese, mustard, ketchup, pickle routine, but this place had a special and I jumped on it. How was the burger? It was fresh and delectable. We needed a burger from a long day on the road and this place delivered. What else makes this place worth the visit? The bar is phenomenal! They have craft beer taps and a ton of whiskey to make you feel comfortable in Tennessee. Even though this has nothing to do with the burger, did you take time climbing the Sunsphere? Yep! It's actually pretty cool and the view from up top is great. It's from the 1982 World's Fair and it looks like a "disco ball" from far away. How did you find this place out in Bismark, ND? My good friend moved out here and can't stop talking about this place. Does the burger live up to the hype? It sure does! This burger is Great! I ordered a double cheeseburger, french fries, and a vanilla shake. After one bite of my burger, I couldn’t stop eating. The burger was delicious! It was one juicy bite after another of pure beef smothered in cheese. I could feel my heart slow down and I would take a break to wash it all down with a swig of milk shake. It took me no time at all and my plate was all empty. I leaned back and savored the flavor with good company. How are the sides? The onion rings are very good and the milk shake is a must. What's up with ordering on the phone at your table? They have menus mounted on the wall at each table and a phone for you to call your order in. We compiled a list of food on a piece of paper and then picked up the phone. In the distance you can hear the phone ring. Eventually someone picks up the phone and takes your order. Drinks arrive at the table and soon burgers follow. Would you go back? One look at my burger and I was ready to plan another trip to Bismarck. What else do the people need to know? Check out the Full Review on File! With so many burger joints in the city, how did you end up here? I made the choice easy, I consulted Hamburger America and made plans to hit the legendary J.G. Melon. Are the melon's nice? Yes they are! There's melon flair all over the dang place. How's the burger? The burger is super delicious. My wife said at the time that it may be the best burger she's ever had. What's up with the sweet red onions? They serve them on the side of the open faced burger. Not my style, so I didn't put them on. I'm sure some people like them. Would this be a good place to hit after visiting a few museums? Yes, yes it would! You can hit a few of the museums in mid town and then go here to refuel after a busy day of walking and standing on wood floors. Would you go here again? 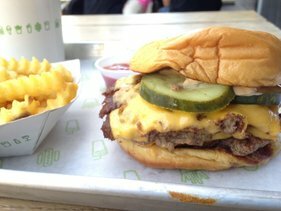 Although there are many places to get a burger in NYC, I will totally go here again the next time I visit. What's the deal? 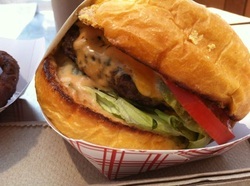 If you're in the Napa Valley area, this is the burger for you. How did you hear about this place? When my wife and I planned our vacation to San Francisco and Napa Valley, I quickly grabbed my copy of Hamburger America to see what burgers I was going to try. In-N-Out Burger and Gott’s Roadside won, and I’m sure glad Gott’s made the cut. What's the place like? There are actually two Gott's locations in the Napa area: St. Helena and Napa. They both have a roadside burger stand feel with lots of patio seating. It's a really cool vibe and definitely worth the stop. How's the beef? The beef is 100% Angus that’s vegetarian fed. It comes from California’s Niman Ranch with no hormones or antibiotics used. 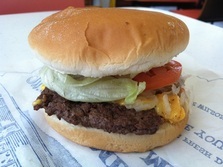 All patties are ½ pound and are served medium-well with a little pink inside. Drinks? If you are at the Gott’s in Napa or St. Helena, you’re right in the heart of a wine drinker’s paradise. Might as well save some wine tasting for at Gott’s. They also have a really big line of local brewed beers on tap. Beyond the bar, their shakes are pretty popular. I tried their chocolate shake, and it was pretty tasty. Anything else? Try the garlic fries! 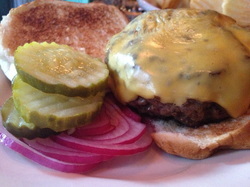 Also, check this out: Lucas's California Burger Hunt - Blog Photo Slideshow. Alright, this is the place, right? There's so much that's unique, and the fact that they aren't in Michigan, makes it a needed stop. What's the first thing? The first thing is that I need to go back. One visit in 2013 wasn't enough for everything to sink in. What's unique about this west-coast fast food joint? First of all, it’s fast food that’s all fresh. Everything, and I mean everything, is as fresh as it gets. In-N-Out Burger is also known for how they treat their employees. They are one of the few, if possibly the only, fast food restaurant that starts their wages already above minimum wage. During my visit, it was obvious that the employees were happy campers. I’ve truly never seen such a well-oiled machine of workers before. Let's dig into the burgers. In-N-Out’s menu consists of three burger varieties: Hamburger, Cheeseburger, and “Double-Double”. That’s all. But, and hold on for this one, In-N-Out has a secret menu at most of their locations. It varies from spot to spot, but I’ve heard about people ordering the 4x4 burger and the Animal Style fry. Sides? Their sides are limited, but they do them right. Their french fries are hand-cut and cooked in 100% cholesterol free vegetable oil. Shakes are made with 100% real ice cream. What else? I have a lot of respect for In-N-Out Burger and all that they stand for. They treat their employees and customers with respect, and everything’s fresh at this fast food burger chain. There’s a strong possibility that In-N-Out Burger remains as the only fast food chain that appears on our website. 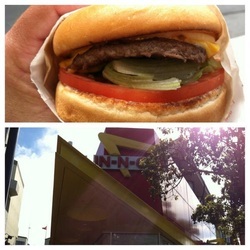 Also, this visit was part of Lucas's California Burger Hunt - Blog Photo Slideshow. Where do you want to start? It could be in a million places. Well, let's start somewhere. 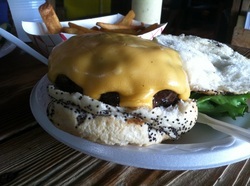 Le Tub, located about 30 minutes north of Miami in Hollywood, FL, was once voted by GQ Magazine as the #1 burger in the county. What's the place like? Sorry, but this could take some time. Located on a stretch of the A1A, Le Tub sits tucked within lush greenery (you have to see the picture of this to really visualize it). Even though our Garmin was taking us straight to the place, we almost missed it. According to Le Tub's website, many locals have been driving by the place for years and don't even know it's there. Le Tub now sits on what used to be land occupied by a Sunoco gas station. The history of Le Tub states that the new owner of the land built the saloon by himself over the course of a year. The place is covered with bath tubs and toilet paraphernalia, and it's impressive multi-level wooden structure makes for a very unique environment. How's the beef? Must be fresh. As I looked around , I saw someone hand-grinding the beef for the day. How about the menu? After taking it all in, it was ordering time. If everything wasn't unique enough, here plops this hand-created menu that seems to be produced via copy machine. It's made from someone's handwriting and it appears that they just sat down one day and made a menu. Written on the menu, very clearly, is a message that tells the customer that he/she should be prepared for a long wait if they order a burger. They go on to state that they do not serve fast food, and the will not let the "wildly increasing demand affect the quality" of their cooking. Motz, in Hamburger America, told a funny story about how he sat down at Le Tub while a friend was hopping off a plane at Miami International Airport. Motz ordered for them both, and when the friend arrived at Le Tub, the burgers still weren't ready. In my case, I'm not sure if it was because they had just opened and there wasn't much of a crowd, but my burger only took about 10 minutes to prepare. And the burger? Their sirloin burger is what most order, and it's a 13oz. masterpiece. As I was ordering, the server noted that she's entered plenty of "burger comas" after finishing it. Served on a soft kaiser roll, Le Tub's sirloin burger is charbroiled, seasoned, and made to order. I know this is a 7th question, but what else? When the burger came, it was served on a paper plate with a plastic fork and knife, and it looked absolutely wonderful. The cheese was oozing over the meat and it delicious and massive. I threw on pickle, ketchup, and mustard. It was time to go to work. 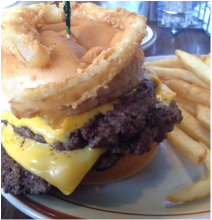 As I ate it, the one thing I noticed was that the burger actually became larger as I moved toward the center. The meat grew thicker, and it kind of gave that perception that it was going to be an uphill battle, literally. Right then and there I knew that GQ Magazine was right, and this was indeed a very special location and burger. How did you hear about this place? After purchasing a copy of Hamburger America by George Motz, any trip Kevin or I take now revolves which burger joint can be hit while on the road. We map out or route and immediately look at the state by state listing from Motz's book. This is how I stumbled into Wilson's Sandwich Shop located in Findlay, OH. My wife and I were headed to Nashville, and Findlay was right on the way. What's their story? Wilson's Sandwich Shop is legendary throughout the Findlay area. According to their Wikipedia page, Wilson's actually started as a spin-off to the Kewpee Hamburger chain. Hoyt "Stub" Wilson opened Wilson's in 1936 and it's been the place for hamburgers ever since. What's unique? It's a true diner feel. They have really good prices - a cheeseburger is only $2.20, and you can make it a "special" for an additional 40 cents, and that includes lettuce, tomato, and mayo. I made my cheeseburger a special and it was go time. The meat? Their meat is ground fresh right at Wilson's. They still use the square patty approach that they took from Kewpee years ago. Here's a fun fact - Wendy's took their square patty approach from Kewpee too. Anything else? Probably the most unique part of the place is that the men's bathroom is actually located on the outside of the building. That's right fellas, if it's not unlocked, you just have to grab the key from the counter. If you're a woman, your bathroom is located inside. Also, get a double burger versus a single. Check out Lucas's Wilson's Blog for more. How far away from downtown Pittsburgh is this place? It's just a short drive to Bloomfield, home to Little Italy and Tessaro's. If you're in the area, check it out! How's the burger and does it stack up to the highly publicized hype? The burger is tasty and lives up to all the attention it receives. What's it like inside? This place brings a strong feeling of the local culture. An older brick building, the entire place is cozy with low lighting and a beautiful ceiling. Okay, so they use Heinz ketchup, but what about the mustard? The mustard is more like a dijon style mustard. Would you go back? I would eat another burger here, but I'd rather look for a different place to check out if I go back to the Pittsburgh area. Do you think your dad would like this place? Yes, I do. I could totally see him going here for a burger if he was in the area.